One luxury that I just cannot do without is a plush, snuggly and oh-so-comfortable pair of slippers. Since becoming a stay-at-home mom, I must admit that I am rarely seen inside the house without wearing a pair. I've always been cold-natured, and so even when the temperature is near eighty degrees indoors, I'm still known to don my trusty sidekicks. Of course, not only should my slippers be comfortable, I like them to also have a little personality, so that they are fun to wear too. Aroma Home has a wide selection of Fuzzy Friends Slippers which are simply adorable to look at and seem super luxurious for my tootsies as well. 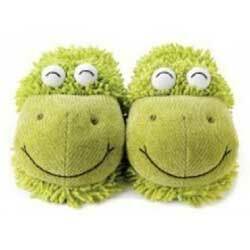 Were the Fuzzy Friends Ladybug Slippers able to make my toes smile? Keep reading to find out! 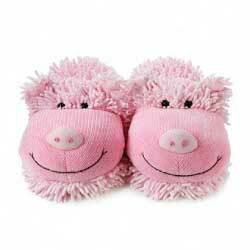 I reviewed the Fuzzy Friends Ladybug Slippers from Aroma Home, which retail for $20.00. Receive 10% OFF your entire purchase with coupon code "RILEY". Hurry, this offer expires August 25th! 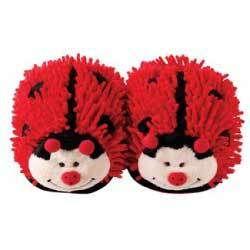 As soon as the Fuzzy Friends Ladybug Slippers from Aroma Home landed on my doorstep, I was thoroughly thrilled! They were so soft and adorable and I loved the long loopy material which gave them their fuzzy appearance. I also admired their precious little faces complete with polka-dotted nose and antennae. I have always been a huge fan of ladybugs and the red and black coloring and random black spots on these slippers looked perfect. Just because the Fuzzy Friends Ladybug Slippers were super fun to wear and to look at, the best part was actually putting them on and wearing them around the house. I liked how they completely covered my toes and upper portion of my foot so that my feet stayed warm while wearing them. I also liked the non-skid bottoms of these slippers, which ensured that I won't take a spill while traveling across the kitchen floor. So if you're like me and your stay-at-home mom wardrobe MUST consist of a lovable, fun and comfortable pair of slippers, then by all means, shop the Fuzzy Friends Slippers selection from Aroma Home. Your toes will definitely thank you! 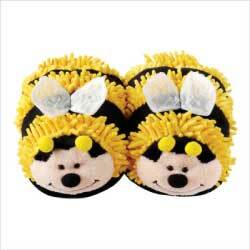 Disclosure: I received the Fuzzy Friends Ladybug Slippers from Aroma Home in order to facilitate my review. No other compensation was received. This product review is based on my own personal experiences with this item and is completely honest and objective.